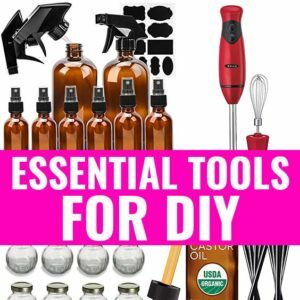 DIY Face Serum for Acne, Scars and Dark Spots - beautymunsta - free natural beauty hacks and more! 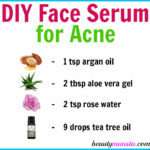 Make your own 3-in-1 DIY face serum for acne, scars and dark spots! If you have acne, chances are your face also has scars from the acne and dreaded dark spots. All these blemishes on the face make it look red, discolored and unsightly. 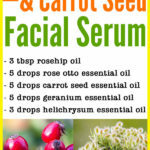 There are several remedies to help reduce these skin problems but making a DIY face serum is one of the best! First off, it’s incredibly easy to make, secondly it is NON-MESSY! Face masks and face scrubs for acne can get really messy during application and when you’re taking it off, your bathroom sink it bound to get dirty afterwards. You know what I mean! Another reason to love this face serum is that it is so easy to apply – just get three drops in your palm, rub both palms together and dab them on your face gently. Pretty simple, right?! Argan oil – This smooth golden oil is what we’re going to be using as our base ingredient. It is one of the best oils for acne. That’s because it has a comedogenic (pore clogging) rating of ZERO! Which means it’s not going to clog up your pores whatsoever! 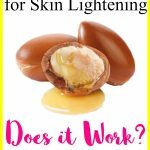 I also love argan oil because it shows amazing skin lightening properties good for wiping off scars and dark spots from your skin! Tea tree essential oil – Tea tree is the best essential oil for acne, in my opinion. It’s a powerful disinfectant so it kills off those notorious acne causing bacteria! It also has astringent properties for reducing excess oil production on the skin! Lavender essential oil – Lavender is soothing for angry red acne. It’s also excellent in fading off acne scars! If you have inflammation on your face, lavender is going to help reduce it greatly! Frankincense essential oil – Frankincense is another loved essential oil for scars and dark spots! It helps heal and fade them at a fast rate! What’s more is that it has antibacterial properties too! Lemongrass essential oil – Oh I love the smell of this essential oil! It is so refreshing and slightly sweet and spicy! It is excellent for healing acne and reducing inflammation. Geranium essential oil – Geranium is perfect for balancing your skin’s natural oils and stop overproduction of these oils. It is also good for healing hormonal acne since it regulates hormones! 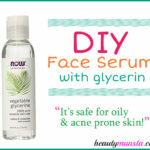 It also adds a nice scent to this DIY face serum! Carrot seed essential oil – This essential oil is SO underrated. It works wonders in rejuvenating skin cells and eliminating blemished and discolored skin! Clove essential oil – I love clove oil for its potent antibacterial properties. It works amazing in fighting off pus-filled acne! What you’re going to do is fill up a 4 oz amber glass dropper bottle with 6 tbsp of argan oil with the help of a funnel. Next carefully add all the drops of essential oils to the bottle. 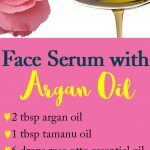 Your DIY face serum for acne, scars and dark spots is ready! To use, place 3-4 drops on one clean palm, then rub both palms together and gently dab them onto your clean face. If you have dry acne prone skin, then dab it onto a damp face to seal moisture! Use twice daily after cleansing your face! 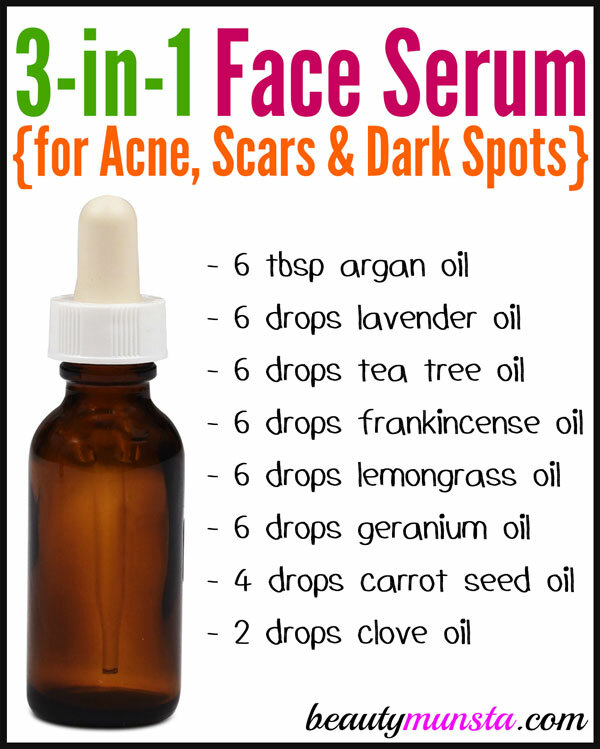 I am SUPER excited for you guys to try this DIY face serum for acne, scars and dark spots! Because it WORKS like crazy! Come share your results, ‘kay?